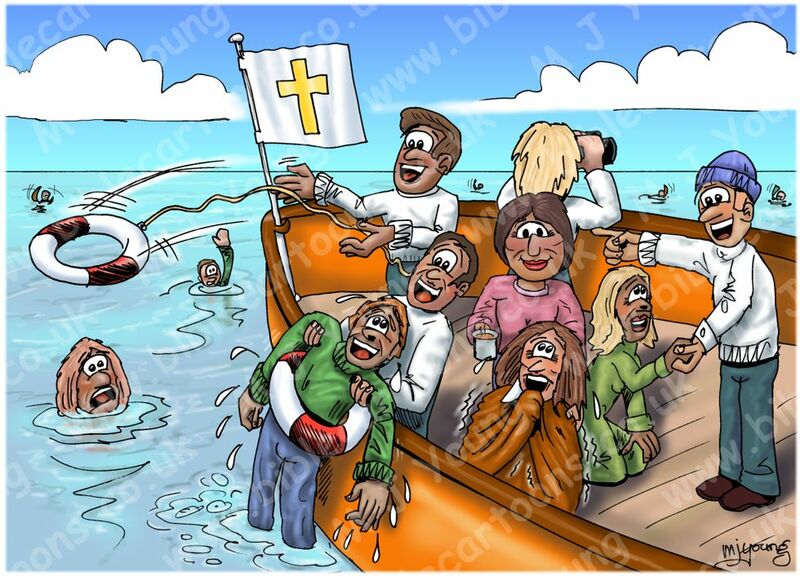 Bible Cartoons: The difference between a pleasure cruise & a rescue mission - Part 3. Quick sketch of Church as Rescue Boat. “We [in Christian church] live like we are on a pleasure cruise, when we are really on a rescue mission from God.” – Reinhard Bonnke (Evangelist). In part 2 I wrote about the dangers facing a Christian church with an extreme “inward” or “outward” focus. Discipleship within the “rescue boat” metaphor. You could argue that a drowning person will climb onboard ANYTHING that looks safer than what they are in at the moment! And I expect that is true enough. But after the initial saving, & once they have “caught their breath”, once they are “safe”, won’t that person start to look around the “boat” to see where they are? What will they see when they climb aboard our “boat”? Now that’s a good question! Hopefully they will see happy, confident, Holy Spirit empower people, who know what they are doing, & why they are doing it. A solid “crew” is a sight to behold! And the newly-rescued person would be attracted to that demonstration of God’s saving power. On the other hand, if that person sees depleted, tired people with very little real life to offer, won’t thy be tempted to “jump ship”? I know I would! This is why it is SO IMPORTANT to KNOW who we are (identity derived from Jesus) & what we are about. So that we can offer real truth & experience to people outside the church. The point of discipleship is to clarify what the newly-saved person has: a new identity in Jesus Christ. But people in a depleted church don’t know that for themselves! And their “captain” may not know it for themselves either! That’s not a good witness at all! The “crew” (congregation) is there to offer assistance to help the Holy Spirit to save that “drowning” person. After that they are to demonstrate the love of God to that person, as they recover from being in the “seas” of life. What can sometimes be forgotten is the powerful testimony that the newly-saved person has. A wise leader & “crew” will immediately encourage that newly-saved person to work on the “rescue boat”: on look-out for other people, still in the “water”; after all, a newly-saved person’s testimony is POWERFUL in speaking directly to other “drowning” people. If a congregation keeps that newly-saved person in the background; helping them to become “churchified” & institutionalised BEFORE they are deployed on the front line, then their raw-edged & powerful testimony may become rather dull! 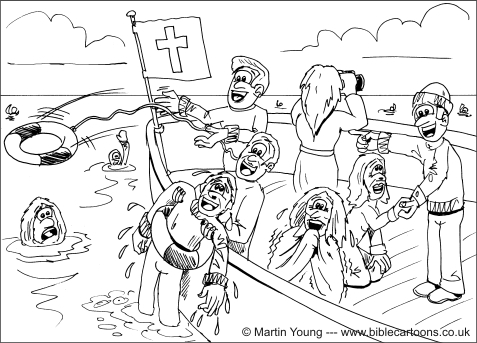 If you look at my quick cartoon above you can see the cycle of survivor-turned-”crew member”: someone being pulled out of the sea via a lifeline by a Christian “crew member”. To the right of that is someone shivering in a blanket, which is equivalent to recovery. Then a member of the “crew” is helping up a recovered survivor & is pointing to others at work, that’s discipleship & volunteering to help. Lastly we see a woman on watch & a man throwing a life line (both previously “drowning” people, now members of the Christian “crew”) throwing out a lifeline to another “drowning” person. You can see the cyclical nature of drowning, being saved, training & deployment to help other “drowning” people. This is how the church is supposed to work. What does the “rescue mission” metaphor mean, in real terms? We can see the danger “drowning” people face, even if they can’t. And it is our responsibility (before God *2) to alert everyone we encounter to their danger. It also means KNOWING what we have been saved from ourselves. Knowing our true identity in Jesus Christ. It means demonstrating REAL love, REAL care, REAL time & REAL sacrifice, for other people. “Throwing out a life line” to a person “in the water” in the rescue mission metaphor means talking to them. Some people may not even be aware that they “in the water”, or in danger of “drowning”. So one of the first things we can do is alert them about the danger they are in. Even so, not everyone actually WANTS to be saved! We might very well offer assistance, but have it refused. That’s OK, as our purpose is to OFFER assistance, not to “save” someone who is dead-set on drowning (pun intended!) We know (from the Ezekiel Bible reference *1 below) that God holds us accountable for telling people about the danger they are in. If a person IS “drowning” (in the rescue mission metaphor) but doesn’t want our help, then there is very little we can do about it. We can’t force people to be saved! We have to respect someone else’s decision about their own (eternal) life. But it is necessary for us to at least warn people of the dangers they may be (blindly) facing. That is the loving, compassionate thing to do. It comes down to our choice… as ever! Which would you rather do, be on a pleasure cruise (focussing on your own experiences & fun) or on a rescue mission, saving souls from hell? Jesus came to save people. That was his mission to earth. Shouldn’t that be ours too? But God shows and clearly proves His [own] love for us by the fact that while we were still sinners [”drowning people in the sea” – MY! ], Christ (the Messiah, the Anointed One) died for us. Conduct yourselves properly (honorably, righteously) among the Gentiles, so that, although they may slander you as evildoers, [yet] they may by witnessing your good deeds [come to] glorify God in the day of inspection [when God shall look upon you wanderers as a pastor or shepherd looks over his flock]. So we [Christians] are Christ’s ambassadors, God making His appeal as it were through us. We [as Christ’s personal representatives] beg you for His sake to lay hold of the divine favour [now offered you] and be reconciled to God. For our sake He made Christ [virtually] to be sin Who knew no sin, so that in and through Him we might become [endued with, viewed as being in, and examples of] the righteousness of God [what we ought to be, approved and acceptable and in right relationship with Him, by His goodness].